The Development and Peace Foundation was founded in 1986 on the initiative of Nobel Peace Prize laureate Willy Brandt. As a partner, he won the then Minister-President Johannes Rau, who assured the support of the State of North Rhine-Westphalia. Other founding members were Kurt H. Biedenkopf, Ralf Dahrendorf, Friedhelm Farthmann, Uwe Holtz, Klaus Dieter Leister, Dieter Senghaas and Carola Stern. They all shared a desire to build an independent forum to discuss global issues and constructively link East-West and North-South themes. "Development, in the broadest sense, is another word for peace." 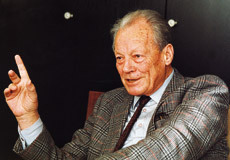 Willy Brandt became chairman of the Executive Committee and remained so until his death in 1992. Johannes Rau became chairman of the Board of Trustees. Peace researcher Dieter Senghaas became chairman of the Advisory Board. In 1991, the Land of Berlin joined the Foundation. On 1 July 1993, the SEF – previously a registered association – became a non-profit-making incorporated foundation under civil law. In addition to North Rhine-Westphalia, Berlin, Brandenburg, and Saxony were now also donor states. "Development and peace are bound by indissoluble links. To seek these out by academic enquiry, to expose them to public view, and to open them up for public debate, is the purpose of this Foundation." Following the end of the Cold War and the East-West confrontation in 1989/90, Willy Brandt saw a historic opportunity for a more peaceful and equitable world. He won Ingvar Carlsson and Shridath Ramphal as chairpersons of the Commission on Global Governance, which in 1995 presented their report, "Our Global Neighborhood." Since then, the report has formed the normative basis of the Foundation's work. Together with the Institute for Development and Peace (INEF) at the University of Duisburg-Essen, the sef: in the 1990s shaped the debate on global governance in Germany. To this day, the challenges of global governance are at the center of the Foundation's work. On the occasion of the 30th anniversary of sef: in 2016, renowned personalities from politics, science and civil society commented on the achievements and future challenges of the Foundation.